Download "Intermediate School District 917 CLASSIFICATION DESCRIPTION Educational Audiologist Department: Special Education"
3 Minimum Qualifications: (necessary qualifications to gain entry into the job not preferred or desirable qualifications) Requires a minimum of a graduate degree in communications disorders or audiology, including one year of clinical fellowship; or an equivalent combination of education, training and/or experience necessary to successfully perform the essential functions of the work. 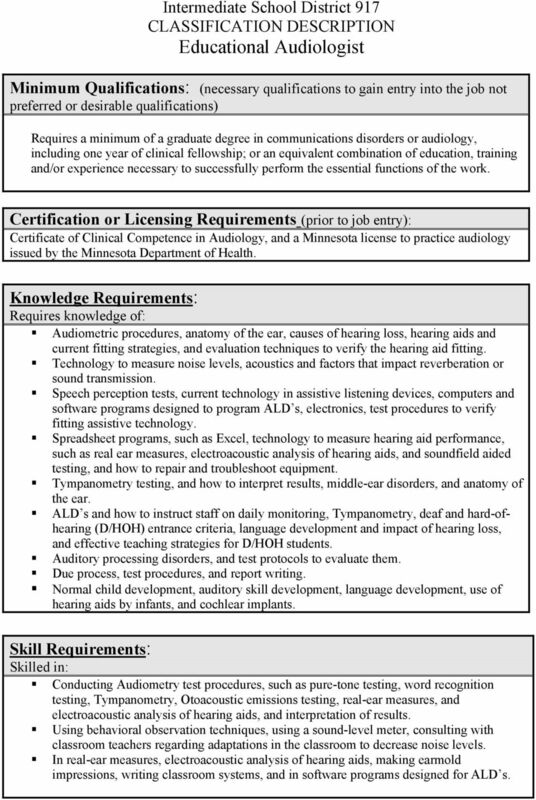 Certification or Licensing Requirements (prior to job entry): Certificate of Clinical Competence in Audiology, and a Minnesota license to practice audiology issued by the Minnesota Department of Health. Knowledge Requirements: Requires knowledge of: Audiometric procedures, anatomy of the ear, causes of hearing loss, hearing aids and current fitting strategies, and evaluation techniques to verify the hearing aid fitting. Technology to measure noise levels, acoustics and factors that impact reverberation or sound transmission. Speech perception tests, current technology in assistive listening devices, computers and software programs designed to program ALD s, electronics, test procedures to verify fitting assistive technology. Spreadsheet programs, such as Excel, technology to measure hearing aid performance, such as real ear measures, electroacoustic analysis of hearing aids, and soundfield aided testing, and how to repair and troubleshoot equipment. Tympanometry testing, and how to interpret results, middle-ear disorders, and anatomy of the ear. 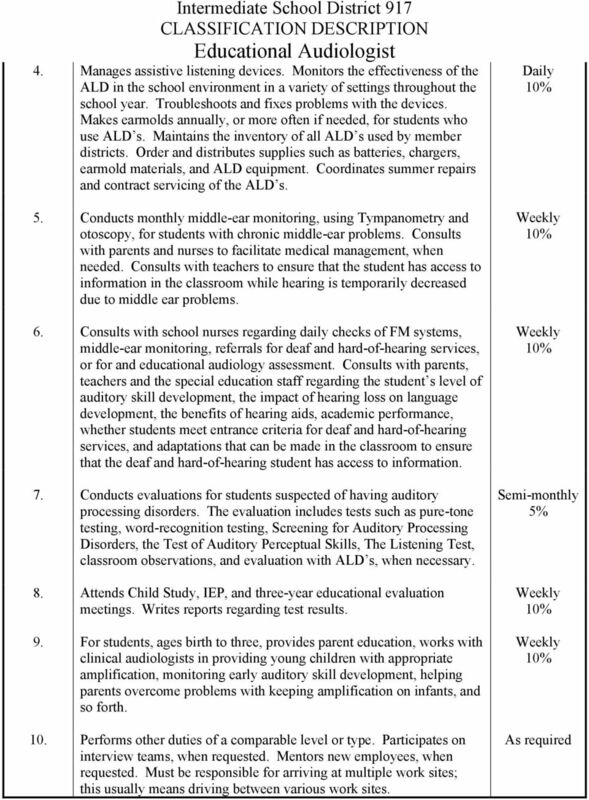 ALD s and how to instruct staff on daily monitoring, Tympanometry, deaf and hard-ofhearing (D/HOH) entrance criteria, language development and impact of hearing loss, and effective teaching strategies for D/HOH students. Auditory processing disorders, and test protocols to evaluate them. Due process, test procedures, and report writing. Normal child development, auditory skill development, language development, use of hearing aids by infants, and cochlear implants. Skill Requirements: Skilled in: Conducting Audiometry test procedures, such as pure-tone testing, word recognition testing, Tympanometry, Otoacoustic emissions testing, real-ear measures, and electroacoustic analysis of hearing aids, and interpretation of results. Using behavioral observation techniques, using a sound-level meter, consulting with classroom teachers regarding adaptations in the classroom to decrease noise levels. In real-ear measures, electroacoustic analysis of hearing aids, making earmold impressions, writing classroom systems, and in software programs designed for ALD s.
4 Using Excel software, word processing programs, Excent software for IEP s, writing up purchase orders and negotiating purchases on large amounts of equipment. Teaching staff to troubleshoot ALD equipment, discussing the impact of hearing loss on language development, academic performance and adaptations that need to be made in the classroom. Conducting, scoring and interpreting tests related to auditory processing disorders. Being a team member and educating staff on hearing loss. Ability to judge what information parents of a newly-identified deaf or hear-of-hearing baby needs at any particular time. Ability to discuss technical results in non-technical terms. Some counseling skills. Physical Requirements: Indicate according to the requirements of the essential duties/responsibilities Employee is required to: Never 1-33% Occasionally 34-66% Frequently Stand Walk Sit Use hands dexterously (use fingers to handle, feel) Reach with hands and arms Climb or balance Stoop/kneel/crouch or crawl Talk and hear Taste and smell Lift & Carry: Up to 10 lbs. Up to 25 lbs. Up to 50 lbs. Up to 100 lbs. More than 100 lbs. 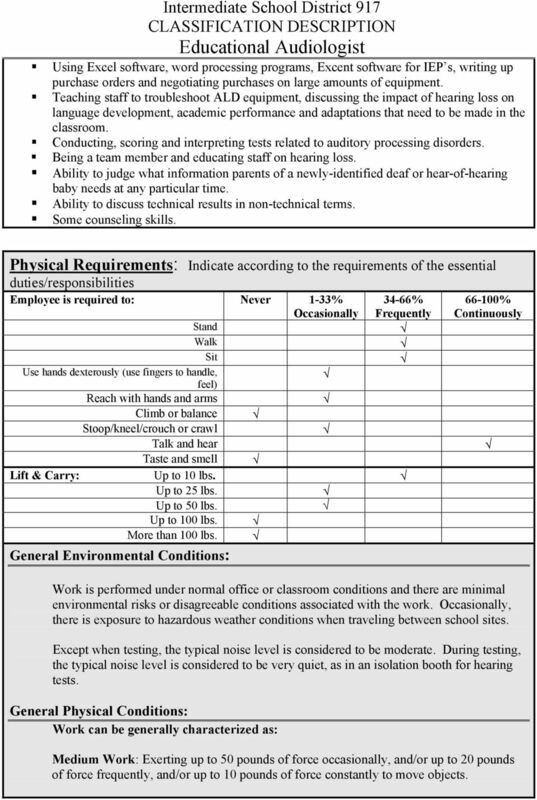 General Environmental Conditions: % Continuously Work is performed under normal office or classroom conditions and there are minimal environmental risks or disagreeable conditions associated with the work. Occasionally, there is exposure to hazardous weather conditions when traveling between school sites. Except when testing, the typical noise level is considered to be moderate. During testing, the typical noise level is considered to be very quiet, as in an isolation booth for hearing tests. General Physical Conditions: Work can be generally characterized as: Medium Work: Exerting up to 50 pounds of force occasionally, and/or up to 20 pounds of force frequently, and/or up to 10 pounds of force constantly to move objects. 5 Vision Requirements: Check box if relevant Yes No No special vision requirements Close Vision (20 in. 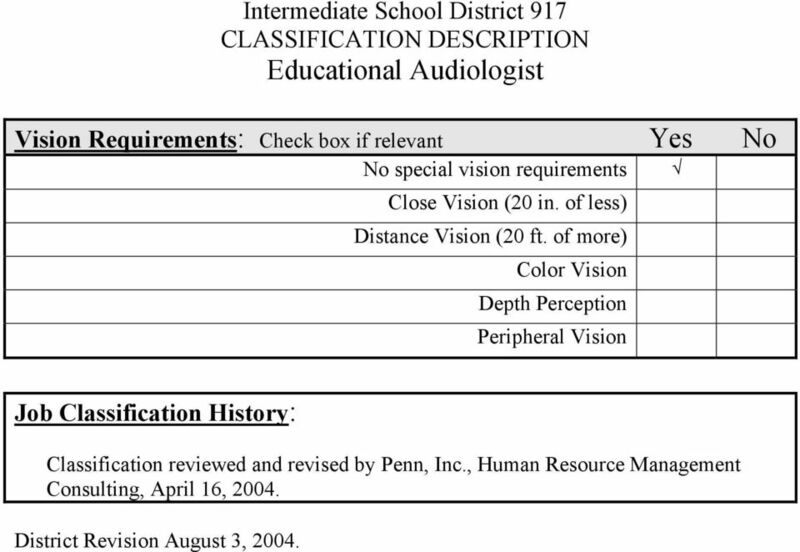 of less) Distance Vision (20 ft. of more) Color Vision Depth Perception Peripheral Vision Job Classification History: Classification reviewed and revised by Penn, Inc., Human Resource Management Consulting, April 16, District Revision August 3, 2004. G/12.a HAMILTON LODGE SCHOOL & COLLEGE Audiology Policy June 2015 To be reviewed: June 2017 (Gov) 1 Introduction Hamilton Lodge School and College (HLSC) provides audiology services to all pupils and students. 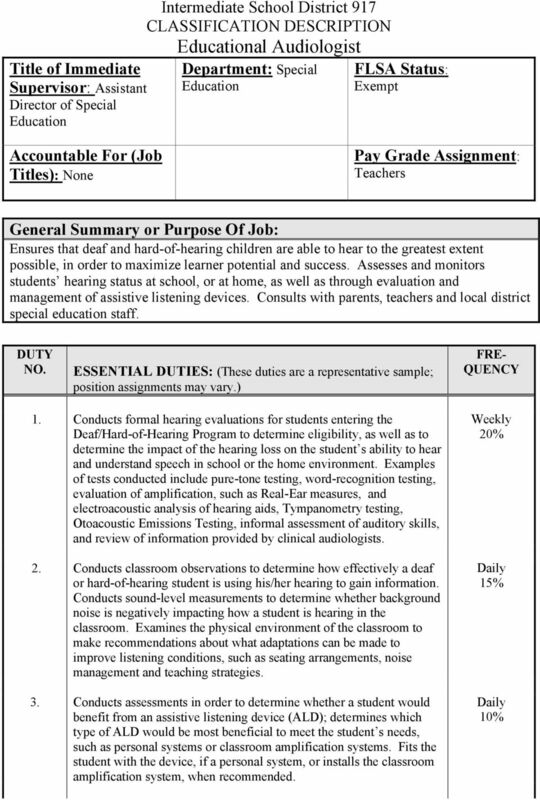 ELMFIELD SCHOOL FOR DEAF CHILDREN Curriculum Policy for Audiology Primary and Secondary - 2 - Throughout this document the terms deaf and deafness are used to denote all type and degrees of hearing loss.